Can the Aug. 21t solar eclipse actually impact the weather? Even in our neck of the woods, where only about 85 percent to 90 percent of the sun will be covered, “this is still enough that weather conditions will be impacted,” the NWS Chicago says on its website. 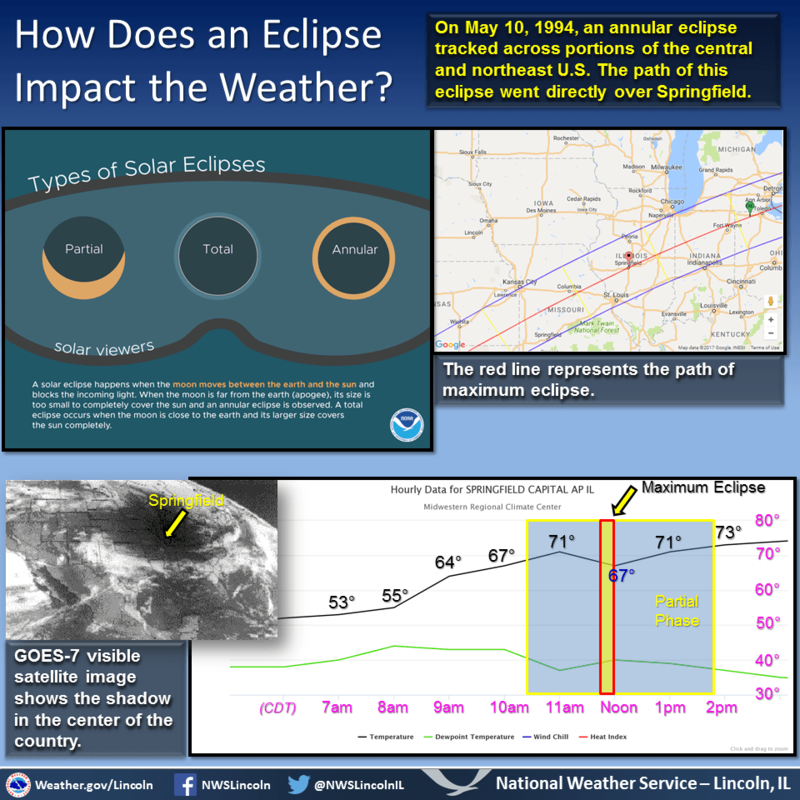 To see an example of this, the NWS looked back to May 10, 1994, when an annular eclipse crossed central Illinois. In an annular eclipse, the size of the moon is not big enough to cover the entire sun, so a ring of light appears around the sun’s fringes. The maximum eclipse was observed at 11:56 a.m. in Springfield, around the time of the routine hourly observation at Capital Airport. The hourly temperature observations showed a steady rise much of the morning, but temperatures fell 4 degrees between 11 am and noon despite a nearly clear sky. The automated weather stations in use today at airports can be interrogated to get minute by minute values, so we can better observe the temperature trend with the upcoming eclipse. So, what’s the forecast for Monday? The eclipse is supposed to last 2 minutes and 40 seconds, start to finish. In the “Path of Totality” (shouldn’t there be trumpets accompanying this phrase? ), in downstate Illinois, the “maximum eclipse” (insert additional fanfare) takes place at around 1:26 p.m.
As of 8 a.m. Thursday, Aug. 17, 2017, the weather in Kane County, IL, (the center of which is in Wasco at good old 41.93°N, 88.43°W) appears OK at first glance. But, for a deeper dive, you can go to this interactive map on the NASA website or the National Weather Service’s interactive map. The National Weather Service’s interactive map provides greater detail about viewing the eclipse across the nation. The map lists a “viewable” percentage for each reporting location. The viewable percentage represents the likelihood of skies being clear enough for the eclipse to be visible. A higher percentage means a viewer is more likely to have a view unobstructed by clouds. Also, a bar chart shows the probabilities for five types of cloud cover: clear (no clouds), few, scattered, broken, and overcast. Percentages are derived from averages of each type of cloud cover.